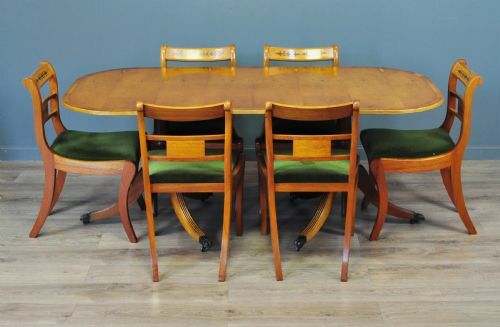 Attractive Ercol dining table and eight chairs. A lovely dining table and chair set from the Ercol furniture range. We date this table and chair set to the second half of the 20th century. The table sits on two shapely end bracket pedestals legs. The legs are braced by an oblong section cross rail. The main table top consists of a large oblong shaped top featuring the distinctive Ercol smoothed edges. The table has a height of 28" (72cm), a length of 72" (183cm) and a depth of 32" (81cm). The chairs each sit on four outward splayed well turned legs. The legs are braced by an 'h' stretcher underneath the seat pad. The back rests continue up from the seat base and feature a decorative ladderback design. The chairs have a height of 41" (104cm), a width of 17" (43cm), a seat depth of 14" (36cm), a backrest height of 25.5" (65cm), and a seat height of 17" (43cm). This lovely vintage Ercol table and chair set remains in very good solid condition with only very minor surface markings commensurate with age and usage. There are some minor marks and indentations to the table surface, primarily to the outer edges. The chairs are also showing a bit of wear to the finish at some of the edges. This remains a very stylish and elegant dining table and chair set. It will continue to provide sterling service for many years to come. 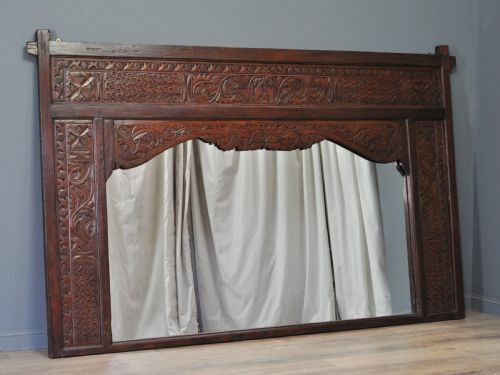 Attractive large vintage eastern carved screen/frame with mirror insert. A lovely large vintage eastern carved screen/frame. We date this screen to the second half of the 20th century. The screen consists of a very large carved panel. There is an open area to the centre that has had a large mirror recently inset. The frame is 61" (155cm) high by 96" (244cm) wide. This lovely screen remains in very good solid condition with only very minor surface markings commensurate with age and usage. This remains a stylish and elegant vintage screen which will continue to provide good service for many years to come. 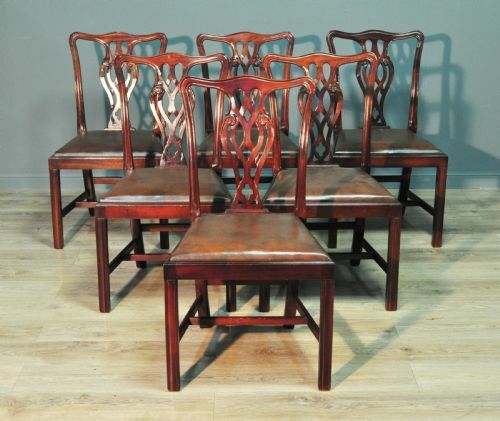 Attractive set of six vintage mahogany chippendale style dining chairs. A lovely set of six vintage mahogany dining chairs. We date these chairs to the second half of the 20th century. The chairs sit on square section legs at the front and slightly backward curved square section legs at the rear. The chair legs are braced with an 'H' shaped stretcher. The chair has a chippendale style backrest. The interior of the backrest is fitted with a very attractive carved and pierced splat. The seat pads have been well padded and are upholstered in a brown leather. The chairs are 36" (92cm) high with a backrest height of 19" (49cm), a seat height of 18" (46cm), a seat width of 21" (53cm) and a seat depth of 17" (43cm). This lovely set of vintage mahogany dining chairs have been constructed to a high standard and remain in very good solid condition with only very minor surface markings commensurate with age and usage. The chairs have some minor indentations and light marks to the frames from past use, primarily to some exposed edges. This remains a very stylish and elegant set of mahogany dining chairs which will continue to provide sterling service for many years to come. Attractive vintage Theodore Alexander side table. A lovely vintage Theodore Alexander side table. We date this table to the late 20th century. The table sits on four shapely turned legs with stretchers at the base. The main table has a drawer beneath the top surface. Inside of the drawer there is a plaque for Theodore Alexander. The drawer features a centre lock (no key is supplied but a suitable replacement should be easily obtainable). The drawer has a two drop handles mounted on backplates. The table has an overall height of 28.5" (73cm), a width of 29.5" (75cm) and a depth of 19.5" (50cm). The table remains in very good solid condition with only very minor surface markings commensurate with age and usage. This remains a very stylish and elegant side table. It will continue to provide good service for many years to come. 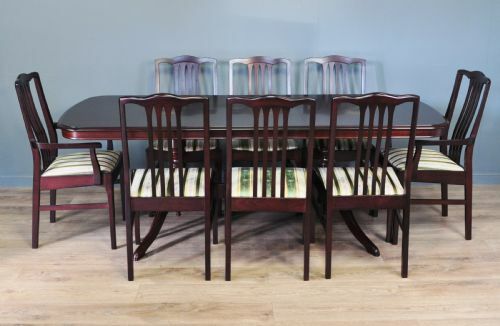 Attractive large yew wood dining table & six dining chairs. A lovely dining table and chair set. We date this table and chair set to the 1980/90's. The table sits on two pedestals with hairy paw feet over castors. The main table is oblong in shape with rounded corners, it has been veneered with well matched finely figured grain yew wood. The table has a height of 29" (74cm), a length of 73" (184cm) and a depth of 36" (91cm). The chairs sit on sabre legs which taper downwards at the front and rear. The rear legs continue up with a slight backward slant and upward taper to form the backrest side supports. The legs are joined at the top by a top and bottom cross rail which scrolls back. The backrest rails have very ornate brass inlay. The drop in seat pads are padded and are upholstered in a green velour material. The chairs are 33" (74cm) high with a backrest height of 15.5" (40cm), a seat height of 18" (46cm), a seat width of 20" (51cm) and a seat depth of 18" (46cm). This lovely dining table and chair set remains in very good solid condition with only very minor surface markings commensurate with age and usage. There are a few light marks to the table top and edges from past use including a scratched area to the top surface and a few very minor marks to the wood frames of the chairs. The material is in a good usable condition but has some minor marks from past use including a rectangular area on a pad where something has sat in the past. This remains a very stylish and elegant dining table and chair set. They will continue to provide good service for many years to come. 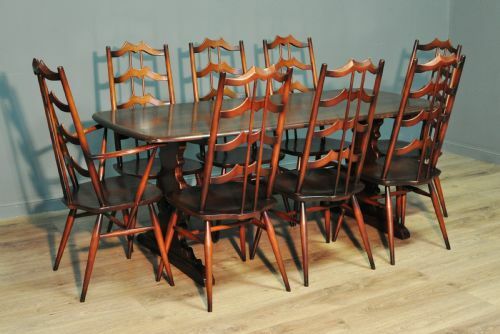 Attractive large vintage Stag extending dining table & eight dining chairs. A lovely Stag extending dining table and chair set. We date this table and chair set to the late 20th century. The table consists of two D-end sections that pull apart to allow the folding extension leaf to be brought out. The table sits on four splayed legs with a stretcher for support. The table has a height of 30" (76cm), an unextended length of 64" (163cm) and a width of 37" (94cm). With the extension leaf in place the length increases to 84" (214cm). The chairs sit on square section legs at the front and backward curved legs at the rear. The rear legs continue up to form the backrest side supports. The legs are joined at the top by arch top cross rails. The main back rests have vertical splats. The carvers are of the same basic form as the side chairs, with the arm rests continuing from the side supports and down to meet the seat pad. The seat pads are well padded and have been upholstered in a regency stripe green and white material. Although quite similar, two of the chairs have been reupholstered with a slightly different material in the past. The chairs are 38" (96cm) high with a backrest height of 20" (51cm), a seat height of 18" (46cm), a seat width of 19" (48cm) and a seat depth of 16" (41cm). This lovely large vintage Stag dining table and chair set remains in very good solid condition with only very minor surface markings commensurate with age and usage, including a few minor indentations and light marks to the surface finish. The seat pads have a few usage marks from past use, please be aware that we have not attempted to have the chairs professionally cleaned. An attractive large vintage oriental nest of tables. A lovely vintage nest of oriental tables. We date these tables to the second half of the 20th century. The tables sit on cabriole legs with carved detail to the legs. The smaller tables are designed to slot under the main table when not in use. 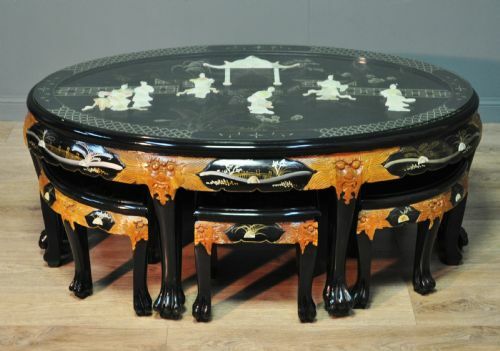 The tables with been black lacquered and the top surface of the coffee table has very ornate mother of pearl carved geishas against a temple background. All the table tops have a decorative shapely edge, with decoratively carved detail at the edges. The small table tops have been gold and white floral painted. The large table has a glass protective sheet. The table nest has a height of 20" (51cm), with a width of 49" (125cm) and a depth of 32" (82cm). This lovely nest of oriental tables remains in good condition with only very minor surface markings commensurate with age and usage. There are some minor areas of wear to some edges from past use. This remains a very stylish and elegant oriental nest of tables. They will continue to provide sterling service for many years to come. 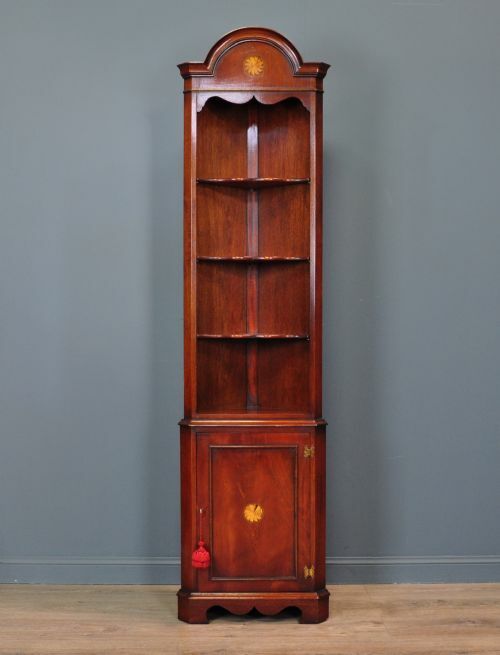 Attractive vintage mahogany display cabinet with base cupboard. A lovely vintage display cabinet. We date this cabinet to the second half of the 20th century. The cabinet sits on shapely bracket feet and features a shapely integral stepped cornice with dentil moulding. The top doors are glazed with bevel edge glass panes. The cupboard door has been veneered with well matched, finely figured mahogany. The doors are fitted with working locks (key supplied). The top interior is fitted with two fixed position, removable glass shelves. The top section is also fitted with a downlight, this is operated by touching the top door hinge on and off. The lower cupboard has a single shelf in the centre. The cabinet has an overall height of 74.5" (189cm), a width of 29.5" (75cm) and a depth of 14" (35cm). This lovely vintage mahogany cabinet remains in very good solid condition with only minor surface markings commensurate with age and usage. This remains a very stylish and elegant cabinet which will continue to provide good service for many years to come. 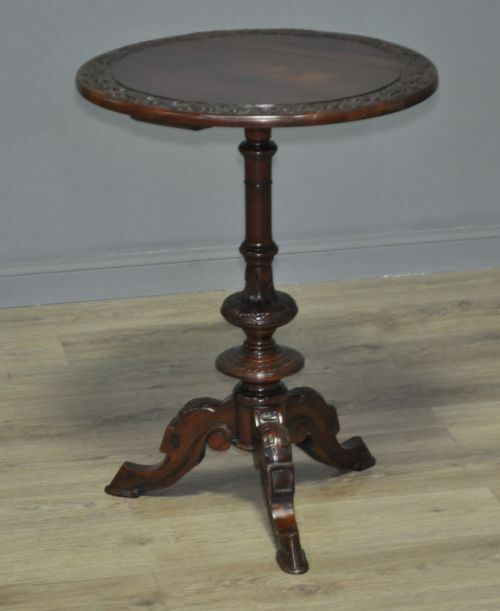 Attractive antique style Victorian mahogany tilt top occasional table. 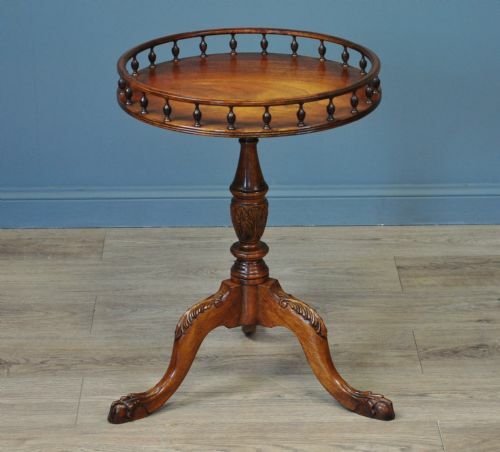 A lovely Victorian style occasional table. We date this table to the mid 20th century. The table top sits on a well turned column, the column is supported on three splayed legs. The legs have ball and claw feet. The main table top is circular in shape with a shapely edge. The table top is held secure with a spring loaded lever catch to the underside. When the top is lowered in place the table has a height of 29" (74cm) with a width and depth of 32" (81cm). This lovely mahogany table remains in a good solid condition with only minor surface markings commensurate with age and usage. There are a couple of minor marks and light scratches to the table from past use and some minor indentations. 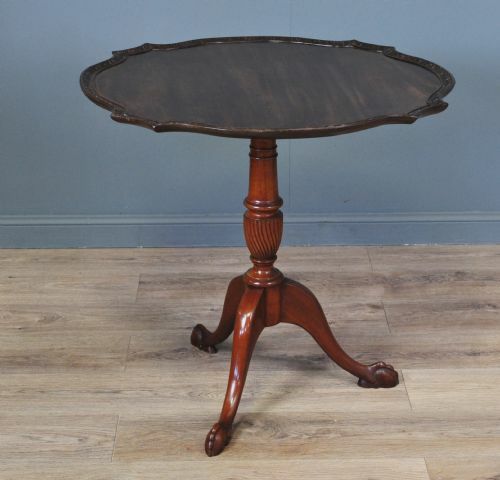 This remains a very stylish and elegant tilt top occasional table. It will continue to provide good service for many years to come. 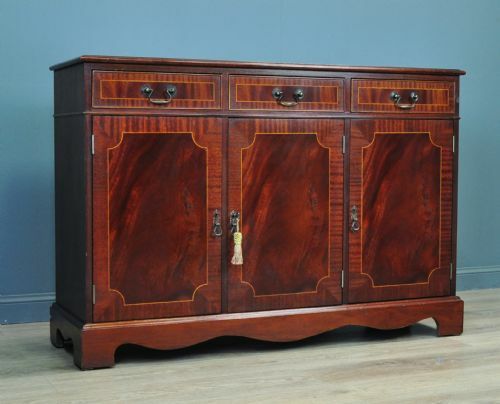 Attractive vintage mahogany sideboard cabinet. A lovely vintage mahogany sideboard. We date this sideboard to the second half of the 20th century. The sideboard comes as a single section. The sideboard sits on a plain plinth base with cutouts to the front and side aprons. The cabinet consists of three drawers over three cupboards. The drawer and door fronts have central panels veneered with well matched, finely figured mahogany within bands of contrasting grain mahogany. The drawers are fitted with swan neck drop handles mounted on circular embossed brass back plates, and the doors are fitted with working locks (key supplied). The interior of the cupboards are each fitted with a removable shelf. The sideboard has a height of 34" (86cm), a width of 50" (127cm) and a depth of 16" (41cm). This lovely vintage sideboard remains in very good solid condition with only very minor surface markings commensurate with age and usage. There are a few minor indentations and minor wear to the finish. There is a bit of wear to the plinth base including a chip to the back outer left hand edge. This remains a very stylish and elegant vintage sideboard which will continue to provide sterling service for many years to come. Attractive vintage Stag Minstrel twin pedestal dressing table and stool. A lovely vintage Stag dressing table. 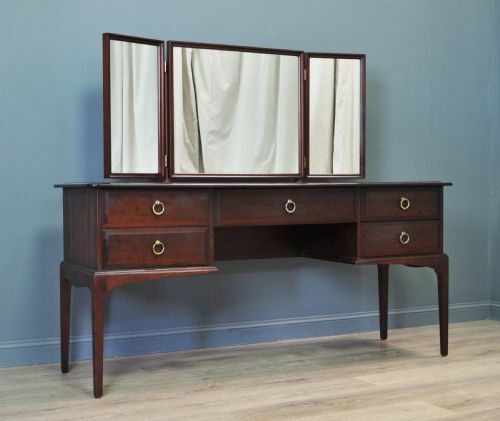 We date this dressing table to the second half of the 20th century. The dressing table sits on four slightly downward tapered square section legs. The table is fitted with a central front to back swivelling mirror flanked by two side swivelling wing mirrors. All of the mirror glass is thick and is showing little or no signs of foxing. The mirrors are side supported on two oblong section legs. The main table comprises two end pedestals each housing two short drawers flanking a central long drawer. The drawer fronts have central raised panels with gently sloped edges and are fitted with circular drop loop handles mounted on short brass pillars. The stool sits on four slightly downward tapered square section legs and has a well padded drop-in seat pad, which has been later upholstered in a patterned cream material. The dressing table has a height of 51" (130cm) (including mirrors) with a table height of 28" (cm)71, a width of 60" (153cm) and a depth of 18.5" (47cm). This lovely vintage Stag dressing table and stool remains in very good solid condition with only very minor surface markings commensurate with age and usage, including a few very minor indents from past use. 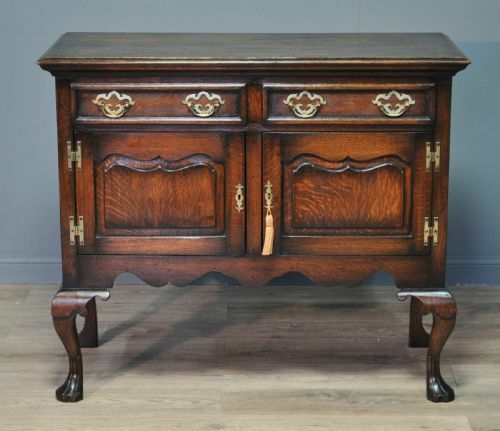 This remains a very stylish and elegant vintage Stag dressing table. It will continue to provide sterling service for many years to come. 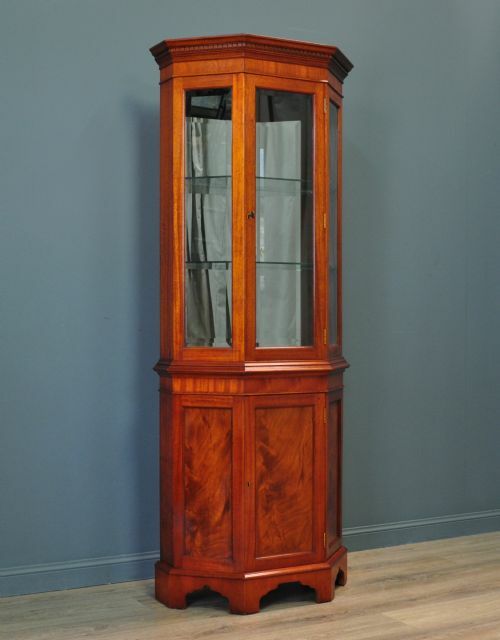 Attractive vintage mahogany corner display cabinet with base cupboard. A lovely vintage corner display cabinet. We date this cabinet to the second half of the 20th century. The cabinet is supplied as a single section. The cabinet sits on shapely bracket feet with a shapely apron, it features a shapely integral stepped arch top cornice. The top section has three removable shelves. The cupboard door has been veneered with well matched, finely figured mahogany. The door and cornice have attractive inlaid fan shaped decoration. The cupboard door is fitted with a working lock (key supplied). The cabinet has an overall height of 74" (188cm), a width of 19" (49cm) and a depth of 14" (35cm) from the back corner to the outer edge. This lovely vintage mahogany corner cabinet remains in very good solid condition with only minor surface markings commensurate with age and usage including a few minor indentations around the base. This remains a very stylish and elegant vintage corner cabinet which will continue to provide good service for many years to come. Attractive antique style walnut Reprodux occasional table. 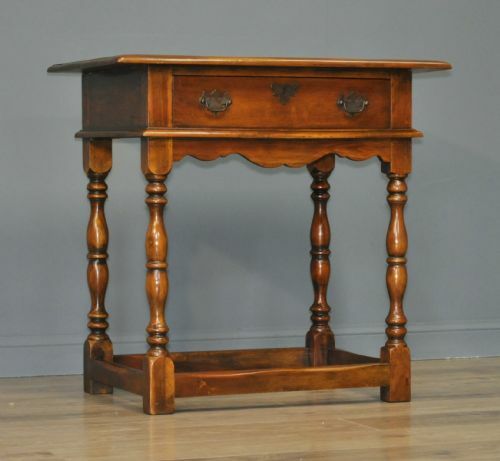 A lovely small antique style occasional table. We date this table to the late 20th century. There is a small plaque for 'Reprodux' furniture to the underside. The table top sits on a well turned and carved column, the column is supported on three splayed carved legs. The main table top is circular in shape. The top edge of the table has an attractive gallery edge. The table has a height of 25" (64cm) and a diameter of 19" (48cm). This lovely table remains in a good solid condition with only very minor surface markings commensurate with age and usage. The top surface has a few minor indentations from past use and the top finish has a bit of wear. This remains a very stylish and elegant occasional table. It will continue to provide good service for many years to come. Attractive antique style mahogany occasional table. The main table top is circular in shape. The edge of the table has an attractive carved foliate edge. The table has a height of 31.5" (80cm) and a diameter of 23.5" (60cm). This lovely mahogany table remains in a good solid condition with only very minor surface markings commensurate with age and usage. The top surface has a few minor indentations from past use. An attractive vintage Stag minstrel bedside cabinet. A lovely vintage Stag bedside cabinet. We date this bedside to the late 20th century. The cabinet sits on four downward tapered square section legs. The cabinet has a central drawer. It fitted with decorative drop ring handle. 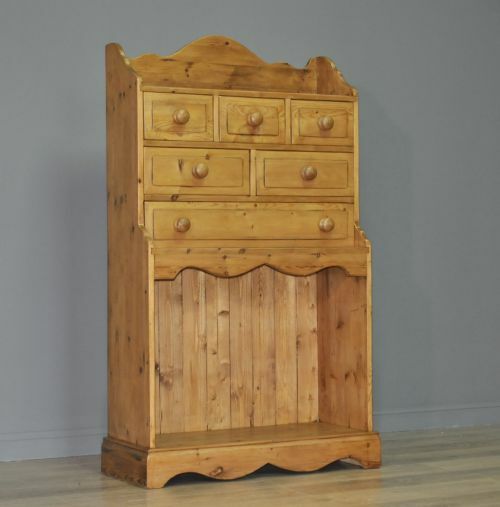 The bedside cabinet has a height of 23" (59cm), a width of 17.5" (44cm) and a depth of 13.5" (34cm). 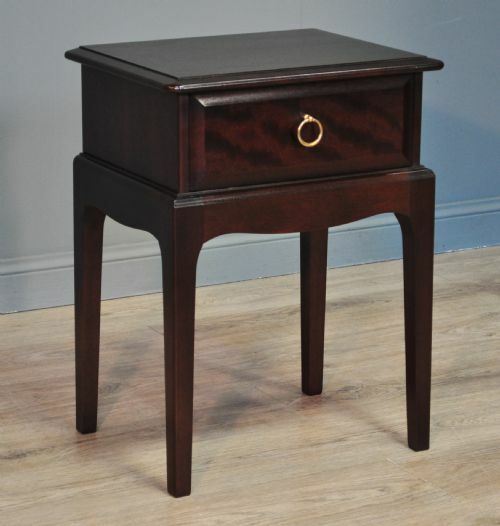 This lovely vintage bedside cabinet has been constructed to a high standard and remains in a very good solid condition with only very minor surface markings commensurate with age. There are some minor surface marks to the top surface from past use. This remains a very stylish and elegant vintage bedside cabinet which will continue to provide good service for many years to come.